The first WordPress music website template on our list is Merchato. It features a unique mosaic design for 2017, which allows you to create a media-rich music website. It integrates perfectly with the most popular musician plugin, AudioTheme and you can easily sell your merchandise using WooCommerce integration. You can also have our team quickly setup your new music site and get professional Envato Hosted support. 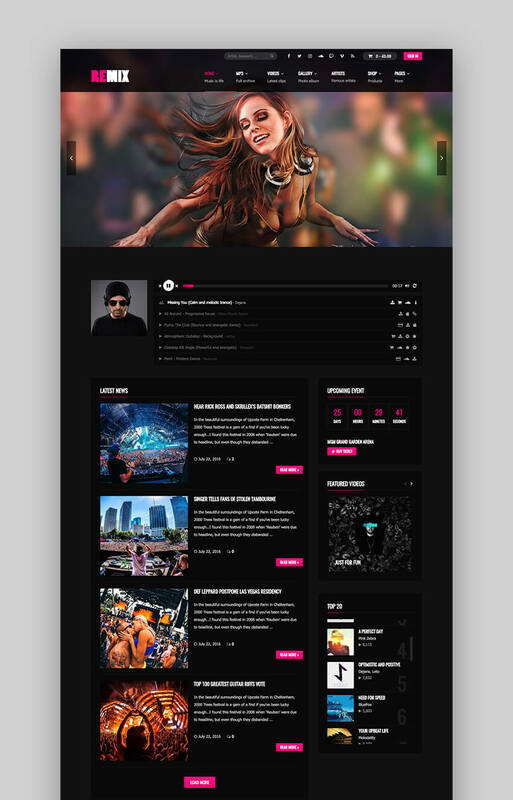 If you want a modern music website template design, then look no further than AQURA. It offers an eye-catching parallax design which is perfect for grabbing the attention of your visitors and includes features such as a beautiful menu, videos, music sections, and galleries. A lot of options to customize with amazing effects. Playbit is modern music WordPress theme design for 2017. It’s suitable for artists, music bands, and musicians who want a flexible and customizable theme. The Zona theme is freshly designed in 2017. It comes with a powerful and fast audio player that looks good no matter which device your visitors are using to view your site and listen to your music. Several demos are available which can be imported with one-click and customized through Visual Composer. On top of that, this new 2017 theme integrates with Bandsintown, Soundcloud, and Spotify player. Use it to get your professional music website launched fast. Try the Audonic theme if you want to showcase your music in 2017, but also want to make use of podcasting abilities. This fresh music WP theme features a clean and responsive design and supports native audio and video players as well as oEmbed. Not only is Audonic a great looking theme, mixamedia has provided me with some of the best customer support I have ever experienced. Cannot recommend this theme or this company more!! Mixtape comes with a powerful admin interface and all the necessary features to show your tracks, albums, sell tickets for your gigs in 2017, and more. You can easily import demo content and an elegant audio player that allows you set your music to play automatically as soon as someone lands on your site. You can also display the location of the venue where you’ll be playing thanks to Google Maps integration. The Wave WP theme was built on Visual Composer for easy layout modification and page design and integrates perfectly with bbPress which means you can create forums and interact with your fans. You can display information about band members using one of the 24 artist layouts and share your tracks from Soundcloud, Shoutcast, or upload your MP3. A standout feature is the ability to view the listen and download statistics so you can always know which tracks are popular with your fans. Lush touts itself as a complete solution for everybody in the music industry. It features a beautiful design as well as tons of features geared for the music professionals. You can also have our team quickly setup your new music site with this Premium theme and get professional Envato Hosted support. The SoundWave theme allows your visitors to experience your music while looking up information about your upcoming events, gigs, artist information, galleries, and more. Each event can be displayed on its own map with its location and venue, the price, and availability of the tickets. You can also embed videos from YouTube or Vimeo. Customize your background, fonts, colors, and more through an easy-to-use theme options panel. The Remix WP theme design is a modern theme with a responsive layout. You can embed MP3 tracks but also integrate with Soundcloud, Shoutcast, and radionomy audio. 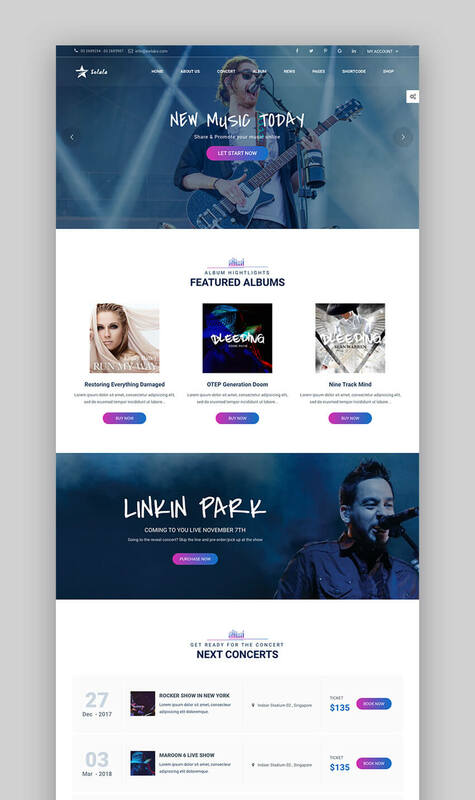 This top music WordPress theme also supports WooCommerce and bbPress plugins so you can easily sell your band’s merchandise and connect with your fans through forums.